Love them or hate them, most living rooms these days are all about the TV. 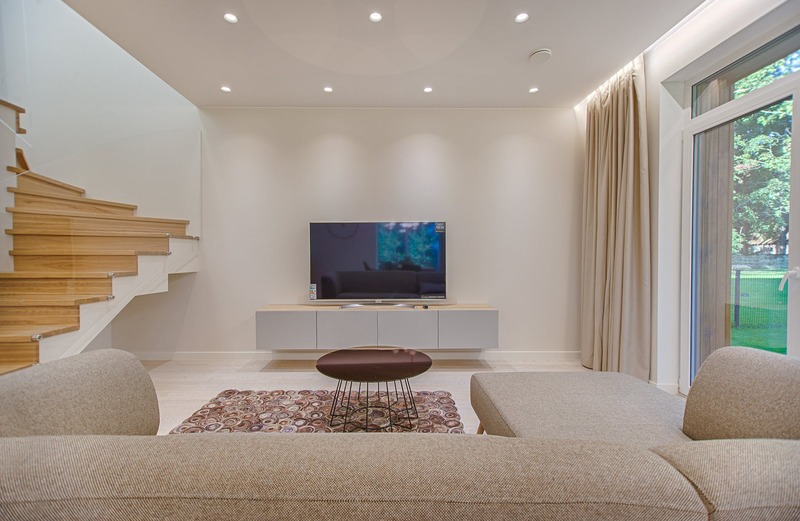 TV placement is one of the top questions we get asked about when designing custom homes and it’s also one of the first things people look for when buying a home. Designing around a piece of technology can be tricky though. Here are a few tips for designing the perfect TV wall. It’s hard to design around something that you don’t yet have. The size of the TV will really influence where and how to place it. Don’t forget to consider the future as well. Technology is constantly changing, which is why we don’t often recommend building a custom sized niche. If you have plans to upgrade your TV soon to a larger size keep that in mind when planning. There is an ideal height that the TV should be hung at. Basically, you want the TV eye level. A common mistake people make is hanging it too high. While this might be fine initially, eventually you may notice neck pain from always having to look up. The higher the TV is hung the further back the sofa should be. If you’re mounting your TV on the wall, a good tip is to have it hung a few inches above the console below. Speaking of TV consoles, they are extremely important. They help ground the TV so that it’s not floating in the middle of the wall. They also hide all those pesky cords and cable boxes. Not to mention they can add style as well as storage. Ideally, the console should be 25-50% longer than the TV. This will keep everything looking proportional and balanced. For some reason, people love to mount TVs over fireplaces. It’s a personal preference, but almost always this results in the TV being hung too high. TV’s work best on flat walls, so whenever possible plan on hanging it not over the fireplace. Also, avoid putting it in the corner. This actually draws more attention to it and takes up more space. As home builders, we’re constantly encouraging our clients to think about light glare when placing the TV. Internal lights are easy to turn on and off, but sunlight isn’t! Curtains and blinds are always an option, but consider how the TV and windows are laid out to one another. It’s often best to avoid placing the TV on the wall opposite a wall of windows. The key to a good TV wall is to edit. People often want to decorate the wall behind or around the TV but this is unnecessary. When people are looking at the screen they’re trying to watch something, not admiring the wall behind it. In fact, too much clutter around the TV can be distracting. So keep décor limited in this area. Want more home design tips or need help building your dream custom home? Contact us today!